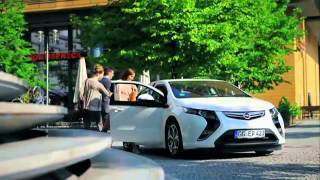 The revolutionary Opel Ampera celebrated its world premiere at the 79th Geneva Motor Show. General Motors Europe president, Carl-Peter Forster, unveiled the extended-range electric vehicle and announced plans to put the car into production in late 2011. The five-door, four-seat Opel Ampera is influenced by Opel's award-winning design language of sculptural artistry meets German precision, incorporating several styling cues from the innovative Flextreme and GTC Concept show cars. The Opel Ampera's wheels are turned electrically at all times and speeds. For journeys up to 60 km (MVEG), it runs on electricity stored in the 16-kWh, lithium-ion battery, and emits zero CO2. When the battery's energy is depleted, electricity from an engine-generator extends the Ampera's range to more than 500 km. The Opel Ampera will also be offered with right-hand drive in the United Kingdom by Opel's sister-brand, Vauxhall. "There could not be a more fitting way to celebrate Opel's 110 years of innovation in the car industry than by revealing the Opel Ampera," said Alain Visser, GME Vice President Opel. The Opel Ampera can be plugged into any household 230v outlet for charging. GM Europe is analyzing the requirements of a recharging infrastructure for plug-in electric cars with energy companies, including Iberdrola of Spain. The revolutionary Opel Ampera will be the first emission-free, electrically driven automobile in Europe suitable for everyday driving. With its Voltec electric propulsion system providing lively acceleration and high levels of refinement, the five-door Opel Ampera seats four passengers in comfort, offers a useful trunk for their luggage, and features an extended range of more than 500 kilometers. "Driving electrically is not only about ecology," said global vehicle line executive and chief engineer, Frank Weber. "Driving electrically is also great fun. Instantaneous, silent torque of 370 Newton meters under your right foot feels like flying!" Electricity drives the Opel Ampera's wheels at all times and speeds. For trips up to 60 km (MVEG), power is supplied by the electricity stored in the cutting-edge, 16-kWh, lithium-ion battery. While driving on electricity delivered by the battery, the Opel Ampera emits zero CO2. When the battery's energy is depleted, a gasoline/E85-fueled engine-generator seamlessly provides electricity to power the electric drive unit while simultaneously sustaining the charge of the battery. This mode of operation extends the range to 500 kilometers, until the battery can be charged by plugging the vehicle's on-board charge system into a standard household 230v outlet. Unlike a conventional battery-electric vehicle, the Opel Ampera eliminates "range anxiety," giving the confidence and peace of mind that the driver will not be stranded by a depleted battery. "An advanced lithium-ion battery system is the key to getting the Opel Ampera into the hands of consumers", said Hans Demant, GME's vice president of engineering. "The engineers at our research and development center in Mainz-Kastel , Germany are testing the battery around the clock, 365 days a year to ensure that it meets the expectations of our customers." The Opel Ampera's battery pack will be manufactured by GM at the first lithium-ion production facility to be operated by a major automaker in the United States . More than 220 lithium-ion cells in the T-shaped pack provide ample power. The nearly silent electric drive unit delivers 370 Nm of instant torque, the equivalent of 150 horsepower, zero to 100 km/h acceleration in around nine seconds, and a top speed of 161 km/h. The Opel Ampera will be well-suited to the daily driving schedule of most European customers. For example, approximately 80 percent of German drivers travel less than 50 km daily. 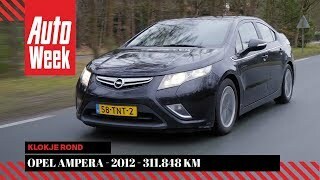 Opel estimates that an electrically driven kilometer in the Opel Ampera will cost about one-fifth compared to a conventional gasoline vehicle, at current fuel prices.